Are you an indecisive drinker? Let this flowchart be your guide. Different beers serve different purposes. Are you sitting outside in the sun all afternoon drinking? You’re probably going to want a pilsner, wheat beer, or saison. Are you a new father taking care of your child? Then you’ll probably want to sip on a session beer as to not get tanked. 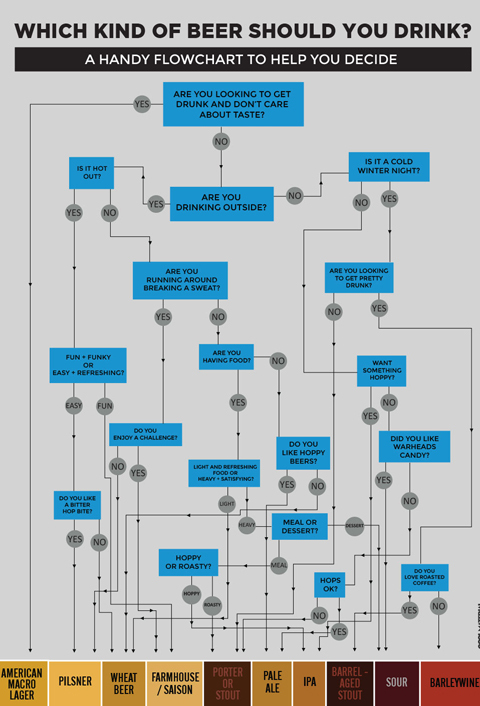 To help you decide what beer to drink when, Cool Material has come out with a handy flowchart. One caveat: the chart kind of ignores the cross-pollination of styles in American craft beer, but as a general outline for indecisive drinkers, it’s great. RELATED: What’s with the Food-World War on Craft Beer?